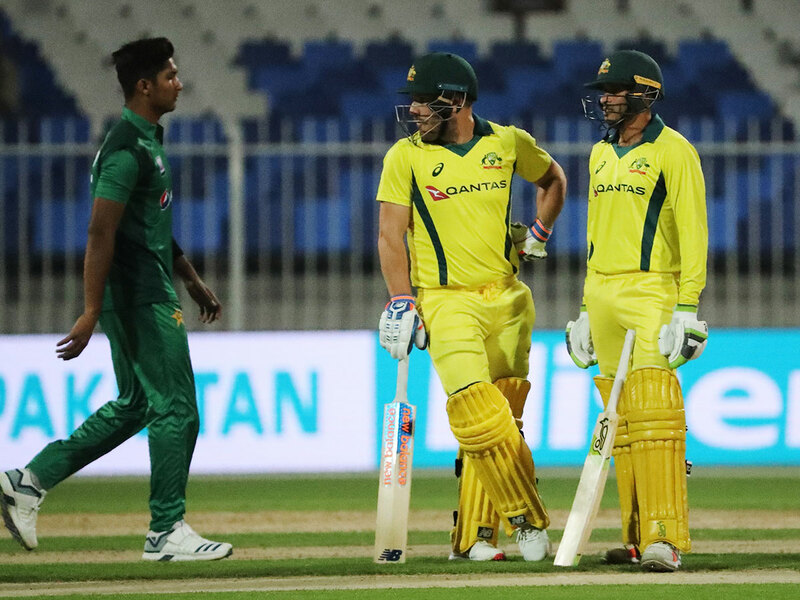 Australia’s Aaron Finch and Usman Khawaja demoralised the young Pakistan team through a mammoth 209 opening wicket partnership and led their team to an emphatic eight-wicket victory in the second One Day International match of the five match series at the Sharjah Cricket Stadium. Chasing Pakistan’s total of 284 for 7, which was four runs more than what they had posted in the first One-day match on Friday, Australia sailed to a comfortable win and took a 2-0 lead. Finch cracked his second consecutive century and 13th ODI ton of his career. His splendid unbeaten knock of 153 runs off 143 balls contained 11 boundaries and six sixers, and along with Khawaja, who hit 88 runs off 109 balls with eight boundaries, made the Pakistan bowlers look clueless. Yasir Shah ended the partnership by making Khawaja pull to Imam Ul Haq at deep mid-wicket but by then Australia needed only another 76 runs in the next 13 overs. Glenn Maxwell through two towering sixes speeded up the victory being run out for 19 ensured the victory with 13 balls to spare. Australia, through this win has announced that they are not a team meant to test any team’s bench strength as they can destroy the confidence of all youngsters that are experimented against them. The fact that their bowlers could not create any impression on the Australian batsmen will have an adverse effect on the team in the rest of the matches in this series. It took them 36.4 overs to break the opening partnership. Australians despite losing their opening bowler Jhye Richardson after five overs to a shoulder injury after taking two wickets still restricted Pakistan to a total below 300. Pakistan could post a respectable 284 for 7 through wicket-keeper batsman Mohammad Rizwan, who cracked his maiden ODI century fully utilising the opportunity that he gained through the absence of regular wicketkeeper and captain Sarfaraz Ahmad, who was rested for this series. His knock of 115 runs came off 126 balls with 11 boundaries and with his skipper Shoaib Malek lifted Pakistan from 112 for 4 in 22.3 overs through a fighting 127 runs partnership in the next 22.1 overs. Malek hit a run-a-ball 60 runs with three fours and one six. Pakistan, for the second time in succession, won the toss and elected to bat. Australia fielded an unchanged team while 18 year-old Mohammad Hasnain made his debut in place of Mohammad Amir. Incidentally, Amir has been in such poor form that he has taken only five wickets since the Champions Trophy in 2017. Opener Imam Ul Haq fell to the fifth ball of the first over from Richardson for a duck. Richardson delivery went through the bat and pad gap taking an inside edge to his wicket. Haris Sohail, who had cracked an unbeaten maiden debut hundred in the first match here, began confidently by hitting Richardson for two consecutive boundaries in the third over. Masood too picked two boundaries off Nathan Coulter-Nile who wavered in length in the fourth over. It looked like both the batsmen were quickly wiping away the impact of an early wicket when Richardson struck again by having Masood flick straight to Shaun Marsh at short mid-wicket for 19. Next man, Rizwan, played two elegant pull shots for two boundaries off Marcus Stoinis. Off spinner Nathan Lyon and leg spinner Adam Zampa were introduced into the attack simultaneously but Rizwan and Sohail kept the score board moving. They pair recorded their 50 runs partnership in 10.3 overs. Skipper Aaron Finch, who introduced himself, struck in his second over with his left arm spin forcing Sohail to edge to wicketkeeper Alex Carey for 34. Umar Akmal, who missed a half century by two runs in the first match, joined Rizwan. He picked his first boundary off a Zampa delivery by square driving through point. Pakistan’s 100 runs came in 19.5 overs. In the 23rd over, Akmal pulled Lyon high to Handscomb at mid-wicket for 16 off 21 balls. He had added 25 runs in five overs with Rizwan. Malek walked in with Pakistan struggling at 121 for 4. Malek hit Lyon for the first six of the innings over long-off. Rizwan used his feet well against spinners and also swept Zampa for a boundary. He reached his half century in 60 balls. Malek too accelerated the run rate and steered Pakistan past the 150 run mark by the 29th over. Rizwan thrashed Coulter-Nile past point for boundary and then swept Finch for two successive boundaries in the 34th over. By the 40th over, Pakistan reached 211 for 4. Malek recorded his 44th half century and Rizwan went on to register his maiden century. Zampa had Malek hit straight to Maxwell at long on for 60 to end the fighting partnership. Rizwan followed, brilliantly caught by Maxwell at long-on, despite losing his balance while taking the catch. He threw the ball up in the air and came back from out of the boundary to complete the catch. Australia bt Pakistan by 8 wkts. Pakistan 284 for 7 in 50 overs (Haris Sohail 34, Mohammad Rizwan 115, Shoaib Malek 60, Jhye Richardson 2 for 16, Nathan Coulter-Nile 2 for 52) Australia 285 for 2 in 47.5 overs (Aaron Finch 153 n.o, Usman Khawaja 88).